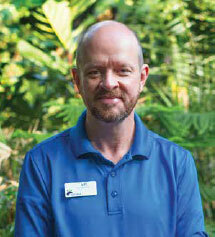 Following the retirement of Mark Reed this year, the Zoo named Dr. Jeff Ettling the new Executive Director. After getting his start in zoo leadership at Sedgwick County Zoo in the 90s, he spent the last 22 years as a curator in St. Louis. Now he’s back and he has an exciting vision for the Zoo in Wichita. We recently sat down to chat and get to know each other. When did you know you wanted to work in the Zoo world? Most kids I grew up with wanted to be astronauts and firefighters … I always wanted to be a zookeeper. It’s funny because at my class reunions, we always point out the fact that I’m the only one actually doing what they wanted to do as a kid. I’m living out my childhood dream every day. What did the path to Executive Director look like for you? When I was in college, it was next to impossible to get a job at the Zoo but I didn’t let that stop me. I stayed in touch with the Zoo so I would know the minute there was an opening. 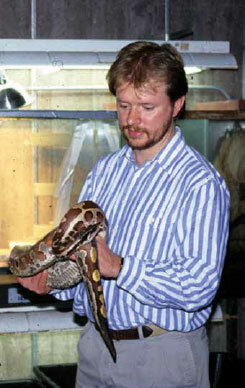 I started as a reptile keeper at the St. Louis Zoo in 1987. In 1991, I applied for the Curator of Herpetology at the Sedgwick County Zoo because I had heard such great things about the growth of the Zoo in Wichita. A few years later, I went back to St. Louis as Curator of Herpetology and I spent the past 22 years there managing one of the largest collections of amphibians and reptiles in the world. While I was in St. Louis, I earned my Ph.D. and learned a lot about the zoo business as a whole. Everything I was exposed to opened my mind to the larger Zoo operation. When Mark Reed announced his retirement last year, it just felt like this would be a way to use this new toolbox and put it to better use. I really look at my career as a very natural evolution. What have your first six months been like at the Zoo? In my mind, it’s all about engaging people and building relationships. My best approach was to get out around the Zoo and meet everyone. Whether that was just talking to everyone I ran into while I was walking around the Zoo, or scheduling meetings with individuals and teams, I engaged with everyone in order to bring them on board with me for the mission and vision of the Zoo. The people here at the Zoo are our most important resource. What is your vision for the future of the Zoo? It’s not about getting bigger, it’s about getting better. For a community this size, we’re a giant zoo. We have 247 acres and the number of exhibits has doubled since I was last here in 1995. I want to take a look at the exhibits that were built during the Zoo’s first 10 years and breathe new life into those areas. We’ll be focusing on our resident animals and making sure they have the best habitats we can give them. It’s all about increasing animal welfare. What is your favorite animal at the Zoo? That’s like picking your favorite child! I’ve always been fascinated by reptiles, especially snakes. I wanted to be a cheerleader for this particular animal that has always been maligned in our society. Armenian vipers hold a special place for me. The species has a very fragmented distribution that was shaped from glacial events 21,000 years ago. They were isolated on mountaintops in Armenia, but in recent times their distribution has been further restricted by human events. Farming is starting to move further up the mountains; climate change is having an impact. During a trip to Russia in 2002, I laid the groundwork for a conservation project that has expanded into a much larger project than anyone expected. If I had to choose a favorite outside of the reptile family, it would be tigers or leopards. 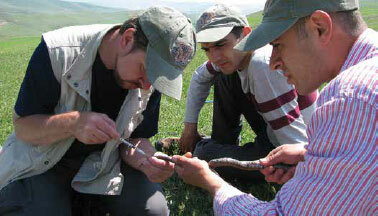 Tell us more about Armenian viper conservation. Working on a doctorate degree in biology with a specialization in ecology, evolution, and systematics, my study was on the Armenian viper. But what I really looked at was spatial ecology, genetic diversity, and population structure. The conservation team started by looking into the human impact on the natural habitat of the species and it has evolved into the enlargement of two existing protected areas and the declaration of two new protected areas. Armenia is a biodiversity hotspot, so there are a lot of species living there that aren’t found anywhere else in the world. We were able to elevate the conservation measures of Armenian vipers, but also everything else that lives in those areas. I recently signed an agreement that allows the research I did at St. Louis to transfer to the Sedgwick County Zoo, which will allow me to involve more of our team in those conservation efforts. I believe the project will continue to mushroom into a much larger program than it’s ever been before. What is your favorite part of coming to work every day? I like interacting with the people at the Zoo. I try to get out there every day to see the animals but also to be able to interact with our team and guests. From day one, it just felt like that would be the most important thing for me to do each day. What legacy do you want to leave at SCZ? We know the Zoo is a great family attraction. I also want people to know we’re an outstanding wildlife conservation organization. I want our community to be assured that the Sedgwick County Zoo is doing everything it can to ensure a brighter future for wildlife right here at home and around the world.